I tried an experiment on my zucchini plants. In the past, I’ve always put a little bit of steer manure mixed with dirt around the roots of my zucchini plants when I put them in the ground, much like I do when planting tomatoes. My plants have always produced a lot of zucchini. However, they have also had ant and aphid problems. I read somewhere that using a nitrogen-rich fertilizer on squash plants attracts ants, which got me thinking about this planting method of mine. Would a plant with steer manure have more ants? Would I see a difference in production? What about the size of the plant? What, in short, did the steer manure do to the plant, and should I keep using it? So, this year, I tried an experiment: one plant with steer manure and one plant without. The plant on the left is without the steer manure. The plant on the right has a mix of steer manure and dirt around the roots. Otherwise, the plants had the same light conditions and water. They came from the same nursery and were both healthy and the same size. Size: As you can tell from this picture, they both got big and robust. They grew at the same rate and ended up the same size. So the steer manure had no effect on the size of the plant. Ants: I did get ants, but they didn’t seem to favor one plant over the other. I nipped the ant problem in the bud (so to speak) by using my outdoor ant trap, and keeping them from getting to established. So steer manure does not attract ants. Production: Here is where the steer manure made a huge difference. 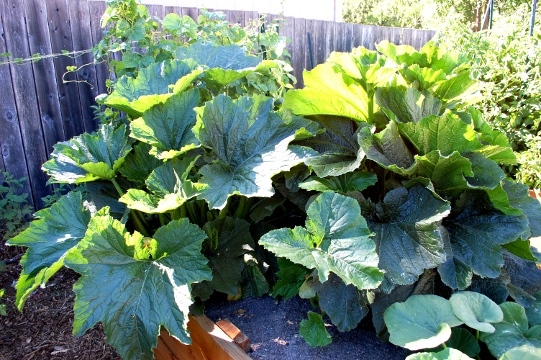 The plant with steer manure produced 3 zucchinis to every 1 zucchini from the plant without steer manure. Of the 90-some zucchinis I picked, 64 came from the plant with steer manure. I don’t know why that little burst of extra fertilizer made such a difference, but it did. 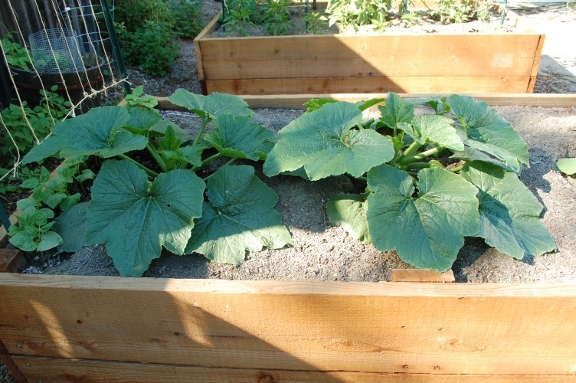 So my results are: steer manure seems to drastically increase the amount a zucchini plant produces. Try it, and see.